Developed by Lancarse. Published by Atlus. Released July 28th, 2015. Available on Playstation 3 and Playstation Vita (Reviewed.) Review copy provided by publisher. A mysterious tower suddenly appears in one of the world's most populated cities. A silver haired man in flamboyant clothing threatens to nuke the world into oblivion unless someone manages to climb the tower and kill him. The U.N. puts together a team of 11 psychics to take on the job, except they all have amnesia! Then add time travel, alternate dimensions, mind-control, robots, and meteors, and you have the latest Atlus strategy-RPG: Lost Dimension. If that made no sense to you, don't worry. 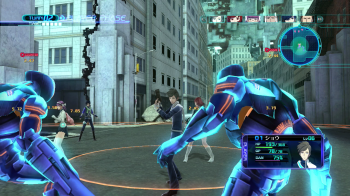 The plot of Lost Dimension is as stereotypically anime as it gets. It's convoluted, melodramatic, and filled with long-winded exposition dumps. Heck, you won't even know what the real plot is until shortly before the game ends, and then there's another, deeper plot that reveals itself only when you play through the game multiple times. Every important plot twist comes out of left field and isn't foreshadowed in any way. It's as if the plot was an afterthought, a slapped together tale used to justify the game's mechanics. 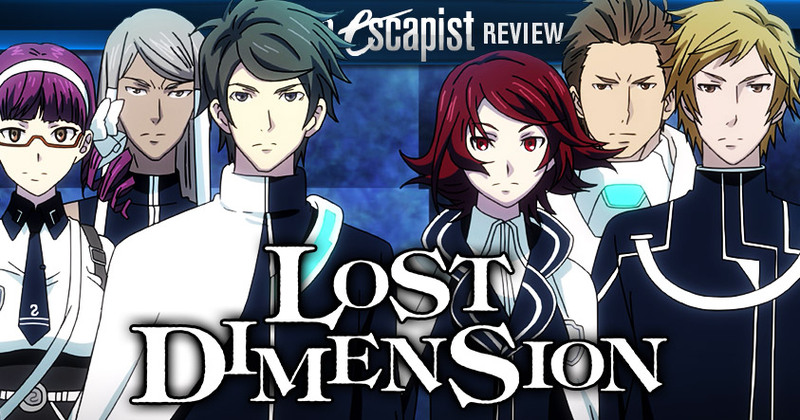 If you can ignore the plot, you are in for a treat, because the mechanics of Lost Dimension are really innovative and enjoyable. The meat of the game is its 3D battle system which plays a lot like Valkyria Chronicles. You control a team of six character and every turn, each character gets to move once and take an action: Either attack, use items, or use special abilities. The unique weapons and psychic abilities of each character are what make battles interesting. Each character and enemy, for example, has a different attack range. If you attack them while inside their attack range they will counter attack you, and since enemies tend to be about as powerful as you are, this doesn't give you much headway in battle. However, if you attack an enemy that is inside an ally's attack range they will attack alongside you, even if their turn is already used up. Much of the game revolves around positioning your units so that your attacks do as much damage as possible with as little retaliation as possible. Each character has HP, their health, GP, which fuels their special abilities, and one more interesting stat called Sanity. Getting attacked and using special abilities causes your sanity to fall, and you can raise it by spending a turn resting or using a rare recovery item. If a character's sanity hits 0 they go berserk, which raises their stats dramatically but also causes them to attack enemies and allies indiscriminately. Whenever a character goes berserk, other characters become afraid, which causes their sanity to lower at twice the rate. This cuts them off from their more powerful special abilities and makes it more likely that enemy attacks will make them go berserk as well, which puts you in a situation that can very easily spiral out of control. Winning a battle gives everyone who participated XP, and everyone who didn't slightly less XP, but the difference is negligible and you'll rarely find anyone lagging behind more than a level or so. You'll also gain EN, which is a currency you can spend on new weapons and items. Gaining a level increases your stats and gives you gift XP, which can be spent on new psychic abilities. Early on, you'll mostly use your basic attack, but later on you'll be doing crazy things like teleporting across the map, mind-controlling enemies to kill themselves, flying, and time traveling in order to dodge attacks.